Arrows Connect (www.arrowsconnect.com) has launched CPD Active, a new online resource that enables all Allied Health Professionals to capture, store, maintain and present their Continuous Professional Development (CPD) profiles. The new system enables healthcare professionals, students and registrants to comply with the regulatory requirements of the Health & Care Professions Council (HCPC). Previously individuals had to compile their own manual records and files, a process that many of them found difficult to maintain to a sufficient standard. CPD Active enables healthcare professionals to check, update and review their calendar of CPD activities and then record them once completed. The system provides information on upcoming professional events and activities that are relevant to the healthcare professional’s ongoing development. There is also a facility to add notes quickly by phone or tablet whilst participating in CPD activities, such as attending conferences. Through CPD Active, health professionals are also able to write and share reflections using a simple 6 question format and to use the system’s comprehensive on-screen help facility to decide what they should include to complete the evidence for their submission. Completing these sections of the site over time prepares users for the possibility of being called for an audit by the HCPC. CPD Active also provides a ‘Learning Area’ where users can participate in the system’s self-directed learning material and learn through others’ submissions. In addition, they can take part in online student or professional discussion forums or create new ones if required. There is also a ‘Professional Area’ with a knowledge bank that includes information on standards, guidelines, policies and general information on the CPD process. It guides users on what to include in their CPD and provides helpful information about the HCPC itself. There is also information for students about becoming practitioners and what to expect as they progress through their careers. Arlene Henry, Marketing Director of Arrows Connect believes that the new system will prove to be exceedingly popular with healthcare professionals, In her view, “Our extensive research revealed that healthcare professionals have found it incredibly difficult to keep on top of CPD completion and that, for some, this has led to negative view of the processes involved especially when it comes to being called for audit. Indeed, we discovered that there were some professionals who had actually completed CPD activities such as attending conferences; only to find the reflection process was difficult to complete. Arrows Connect was set up by Arlene Henry, Catherine Graham & Cara Dutfield who met studying Occupational Therapy at the Robert Gordon University in Aberdeen. 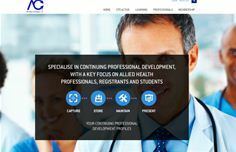 Their experience of Continuous Professional Development (CPD) for a university project highlighted the difficulties that many Allied Health Professionals faced in completing their CPD profiles in line with the standards of the Health & Care Professions Council (HCPC). The HCPC keeps a register of health and care professionals that meet standards for the training, professional skills, behaviour and health of professionals from 16 different fields. These are: arts therapists, biomedical scientists, chiropodists / podiatrists, clinical scientists, dietitians, hearing aid dispensers, occupational therapists, operating department practitioners, orthoptists, paramedics, physiotherapists, practitioner psychologists, prosthetists / orthotists, radiographers, social workers in England and speech and language therapists. Each of these professions has at least one professional title that is protected by law requiring registration by the HCPC and completion of CPD profiles. Extensive research conducted by Arrows Connect confirmed the founder Directors’ beliefs that other qualified professionals and students had the same difficulties and in fact it also revealed that, for some, there was a very negative view of CPD and that many were nervous of the prospect of being called for audit by the HCPC. Some healthcare professionals had done the hard work of going to events and learning experiences but found the reflection process difficult. Arrows Connect then developed CPD Active a new online system to resolve these issues. CPD Active will capture, store, maintain and present their Continuous Professional Development (CPD) profiles. Pre-launch surveys revealed a strong demand for the introduction of this kind of product across all Allied Healthcare Professions.